All charters booked to take place between 19-OCT-2013 and 15-DEC-2013 receive 10% discount on 6+ days.Further 5% discount on any 3 or 4 guest charters using only 2 cabins! In each case, one dinner to be taken ashore at charterers' cost. Dreaming On is a luxurious Leopard 47 catamaran offering a very spacious interior with 3 queen size guest cabins, all with en suite facilities. And outside, a large cockpit for socialising, relaxing and dining in comfort, plus loads of deck and trampoline space for sunning and relaxing in our double hammock. Dreaming On offers an array of water toys and water sports for your enjoyment. 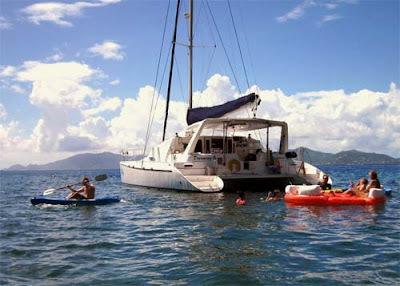 Her professional crew are ready to take you on a voyage of discovery around the paradise of the Virgin Islands. Join Dreaming On for a vacation of a lifetime. Children of all ages are welcome. Spacious cockpit with hardtop bimini, dining table and cushioned seating area. Large, full width trampoline with double hammock for sunning or relaxing.